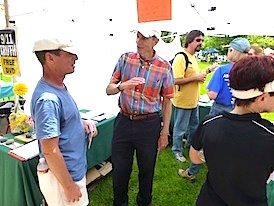 People’s Fair Outreach a Great Success! 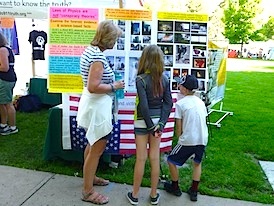 Please enjoy these photos and stories from our booth at the Denver People’s Fair in June. 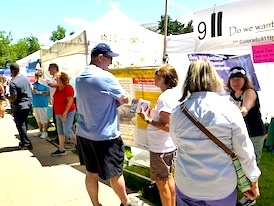 For the eighth year in a row, Colorado 9/11 Truth’s display at the People’s Fair in Denver reached hundreds of people with information, brochures, and DVDs. Left to right are Dorothy, Earl, Michael, Fran, and Joseph. 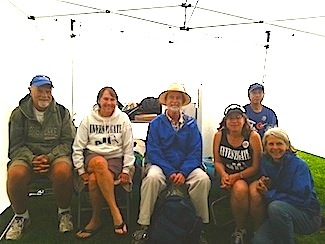 Other booth staffers, Matt, Marti, and Bob, appear in photos below. 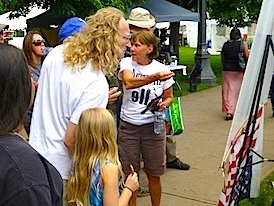 Joseph’s posters were a hit, with many people standing for long periods reading them. 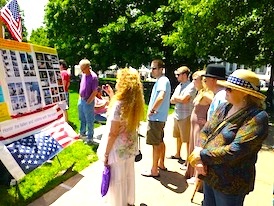 The World Trade Center 7 banner also attracted much attention. Knowledgeable viewers would often point to the displays and explain the information to friends and family themselves. 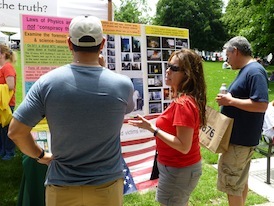 Other people had never heard of WTC 7 or of any of the evidence we present, so our booth volunteers were there to help. 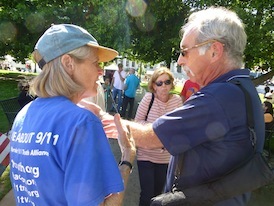 Here are stories and photos of our interactions. 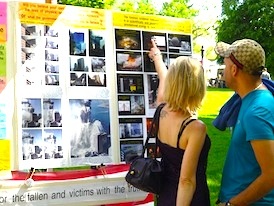 Joseph: A middle-aged Mechanical Engineer (ME) from Chile saw media footage on 9/11 when living in Chile. As an ME, he knew something was terribly wrong with the official story at that time. I told him that the laws that were put in place after 9/11 are similar to the laws that were passed in Chile under General Pinochet. 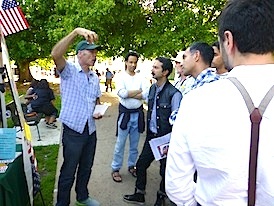 He was very pleased and impressed we were there doing this outreach and getting information to the public, and he thanked me several times. I offered him the international edition of the DVD Experts Speak Out, and let him know that he would see in this film other engineers saying the same thing that he was telling to me. They were relieved, but still obviously shaken by the material in the booth, and the male, in particular, really wanted me to hear his philosophical worldview, which I listened to for a few minutes. 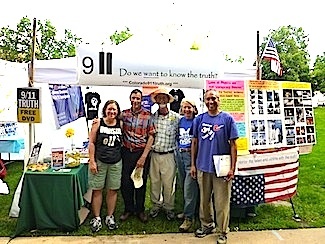 Eventually, I turned the conversation back to 9/11 and asked them both, “If what we are saying about 9/11 is true, would you want to know?” “Oh yes! Definitely!” they replied. 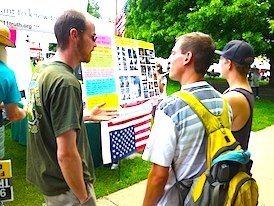 The great majority of our encounters with the public were positive, as depicted by the above stories. There were a few more challenging interactions, but nothing like the vitriol that we experienced in the early days of our organization. The following story is one example of a more negative interaction. I replied sincerely, “I am so sorry. We don’t mean to be disrespectful. We see this as a symbol that our country is in dire distress. We mean no disrespect, whatsoever. In fact, we want to prevent people like you from being killed due to lies our government has told us.” He seemed a bit more calmed, but took his leave still feeling somewhat disconcerted. Working with YOU for truth and peace! 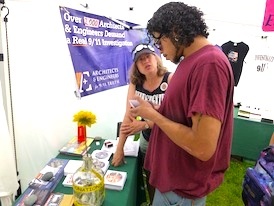 9/11 Truth Action, Colorado 9/11 Truth, People's Fair. permalink.